What makes travel gear travel gear? First, it needs to be dependable. Good gear should inspire confidence to attempts feats of angling derring-do, whether that be establishing a mousing bivouac deep in Michigan’s Upper Peninsula or driving non-stop from Georgia to Labrador. It should also be comfortable: your travel gear should never add to the discomfort of travel and at the very best should relieve a good deal of it. Travel gear should be fun, too: you didn’t take time off work and cough up coin for a hum-drum time. Lastly and perhaps most importantly, travel gear should free you from the strictures of your regular habits and daily limitation, else why travel in the first place? The recommended items on this list have been carefully vetted and casually tortured over the course of a long summer filled with perhaps more travel than is advisable in a single season. To be completely honest, I brought this rod (8-weight incarnation) as a backup rod on a ten-day Ontario canoe loop, since the odds of breaking a stick in the back country are a little higher than average and the consequences much more grave. Out of curiosity I rigged it up first—and then for the rest of the week didn’t fish another stick for more than about five minutes, which is about the amount of time I realized that the Predator was just way more fun. Simply put, this rod is just effortless to cast, even from very awkward angles, say, seated in a canoe or peaking around a highway overpass—all the unconventional casting positions and platforms we encounter when we travel outside of our comfort zones. It’s also a stick that’s happy to accommodate a range of lines. Paired with a matching line, it provides feel and control over all your “fishing” distances—say, 50 feet and closer. But underline it by one line weight and you’ve got a rod very capable of longer casts with a minimum of angler effort. As far as action goes, even though Redington lists it as fast it’s probably closer to medium fast, though it’s snappy recovery makes it feel quicker. I’m looking forward to trying it in other models—especially a muskified version. The price couldn’t be more right. 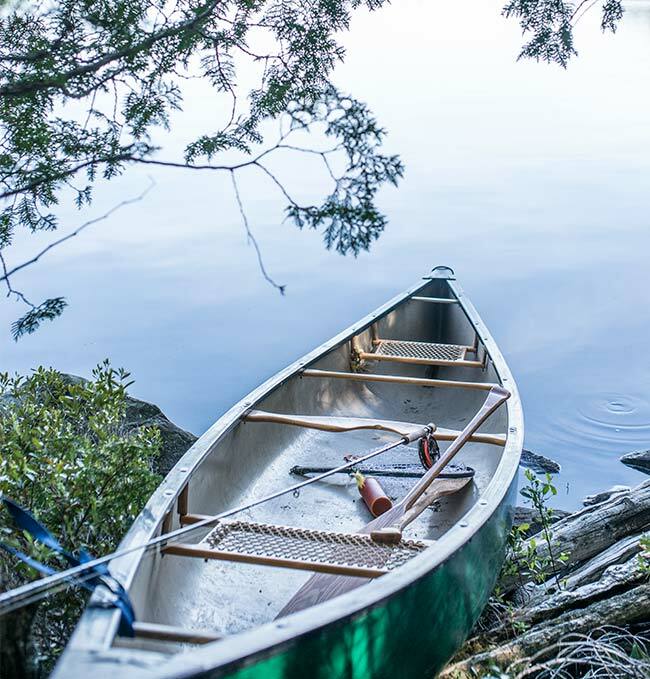 This past summer I was forced to retire what had been for years a dependable watercraft, so I had a chance to think about how my boat needs had changed and what would suit me best right now. I decided that the ability to fish wherever and whenever I wanted was of primary importance, so I needed something that 1) lived in my Jeep, 2) handled seriously moving and seriously still water equally well and 3) was carryable across long distances. In my quest for a simple, do-everything watercraft I came across Innova inflatable kayaks. Their Safari model looked to be just the right size (ten feet) and and level of simplicity (three bladders: two sides and the floor). I was initially impressed by how rigid it felt for an inflatable, but that soon gave way to how comfortable I felt in it. I had always associated sit-on-top kayaks with extreme discomfort, but the Innova is essentially one large, tapered, supportive cushion (deflate the seat and foot rest and you’ve got a prime summertime still water nap-craft). It’s also self-bailing, so you don’t have to worry about taking in water if you get into some hairier paddling situations, which of course you should (the Safari is Class III rated). Speed-wise, you can really boogie on this thing if you need to cover a substantial piece of flat or still water in a hurry. Extreme versatility is what you get here in this compact, ultra-maneuverable package. A few applications I subjected the boat to included but was not limited to: paddling deep into thick weedbeds on farm ponds and twitching rubber-legged foam offerings openings for bass, dragging it through brush to access remote spring ponds and their rarely accessed brook trout, paddling 8 miles of new wilderness smallmouth water without worrying about what I’d encounter (few things are as liberating as being able to pick an unexplored river on a map, throw in a water, snacks and a handful of smallmouth flies and shuttle yourself with a bike). Next challenge up will be packing this along on my annual fall musky trip to see what lives way up in the feeder creeks. And somewhere along the line this thing is going to find it’s way onto an airplane, since it packs down to the size of a large backpack and at 24 lbs is very friendly to most any air travel. 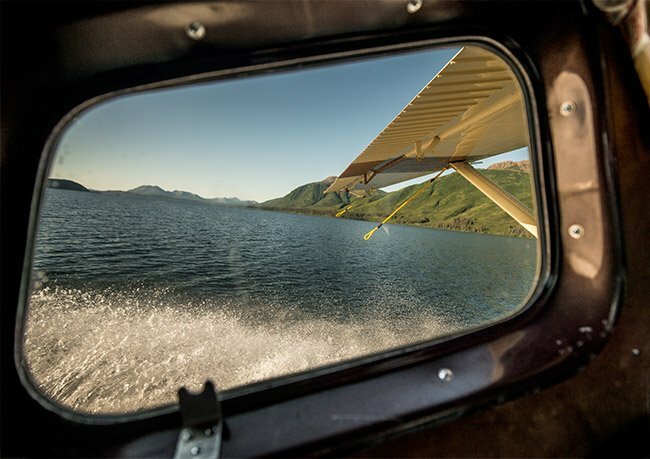 The light weight of this craft makes all kinds exploration a less worrisome enterprise: if you come up on a passage of low water—or no water—the Safari drags exceptionally easily over rock, sand, you name it. The fact that it’s made not of PVC but of 1200-denier Nitrylong (a laminate of nitrile synthetic rubber and natural rubber applied over low stretch polyester fabric) means it will take a lot more abuse and last much longer than many other floatables on the market. And while it does come with a pack that comes in handy for longer hauls, I’ve found it’s at it’s most ergonomic when inflated and tucked under an arm. That said, at 24 lbs it’s light enough to be put in a pack (it comes a basic backpack) and carried up into high country trout lakes. 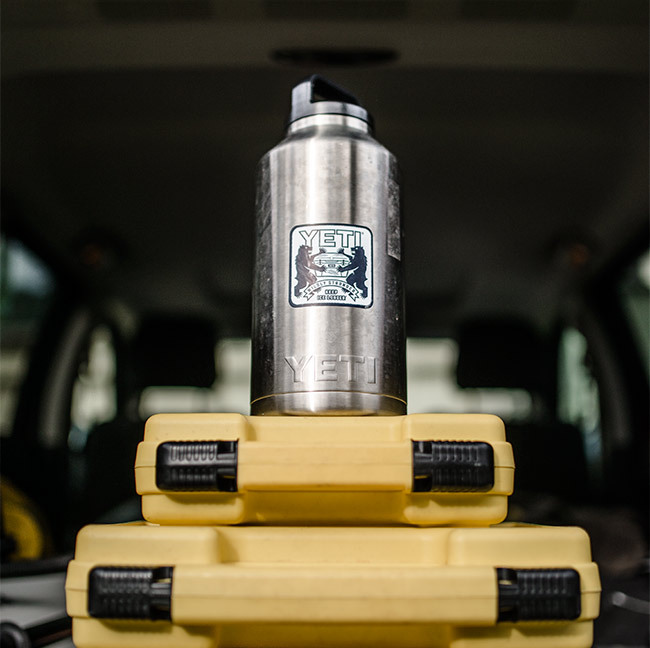 Despite it’s small size and weight there’s a fair amount of storage fore and aft—enough for a multi-day trip if you stick with ultralight gear and use a water filter for hydration. 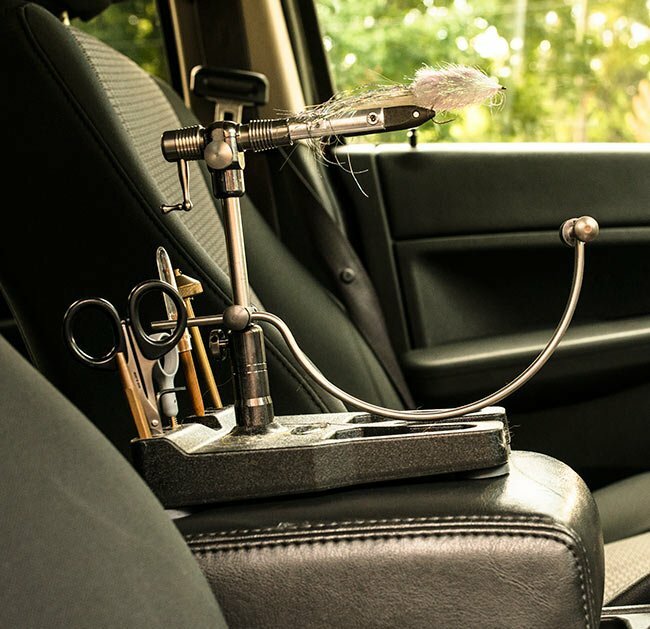 That said, whether out for the week or the afternoon you’ll want to keep all of your fishing implements either in front of or on you: it’s just too much of a trunk twist to access the rear storage every time you want to change flies. 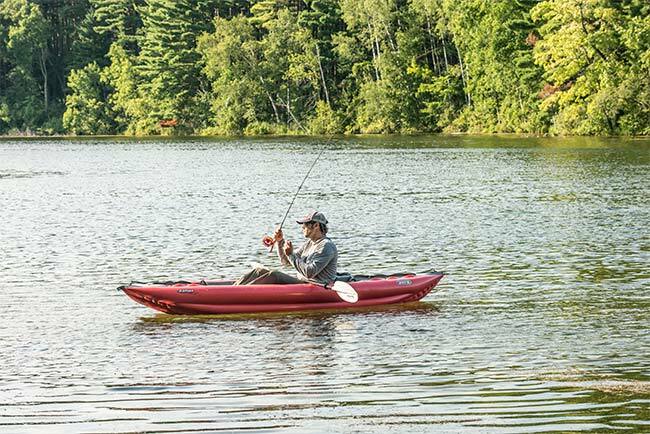 This is not a specialized craft like some fishing kayaks out there, but there’s so much variety in terms of how people set up their systems that I’d rather have a blank slate I can customize than a pre-set design made by some engineer who may or may not fish like me. Seeing as how it’s an inflatable, your imagination is limited only by how many D-ring patches and how much industrial adhesive you can get your hands on. It should be noted that this watercraft suffers from the same affliction that affects all inflatable watercraft—wind really knocks it off course. Luckily, that sensitivity to wind also makes it sensitive to even a very light anchor. Am eight pounder and some paracord keeps you still when you want to be. Gear bags are a bit like fly rods: in the same way that no one rod is best for any angler because of different casting strokes, no one bag or bag system is best for everyone based on different packing styles/organizational abilities. I, for my part, am a bit of a haphazard packer, so I like to be able to see as much of my gear as possible. For the same reason I also favor having fewer, larger bags, since it’s just easier for me to keep track of things. It’s for both of these reasons that I’ve really really taken a liking to the new Expedition Series of bags from car-top tent-maker Tepui. Both the Duffel and Gear Container feature low profile with wide footprints, making more of your gear accessible to your eyes and hands at any given moment. 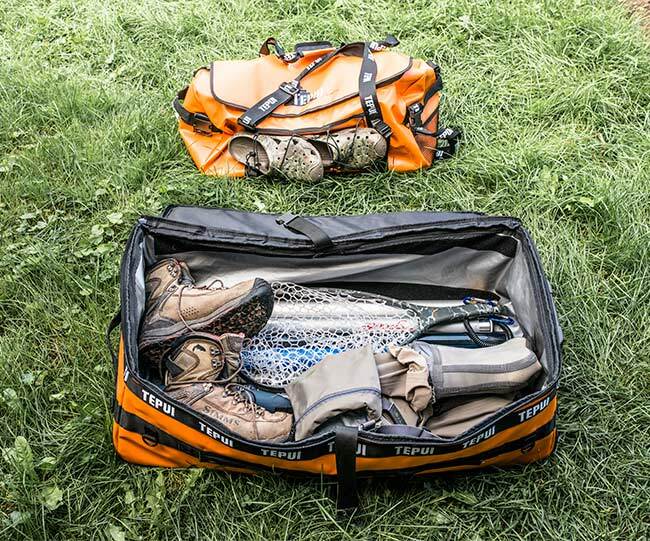 The Duffel holds all the soft goods you might need for a few days of fishing, while the Gear Carrier will give home to boots, tents, waders, rods, reels, camp chairs and the like. 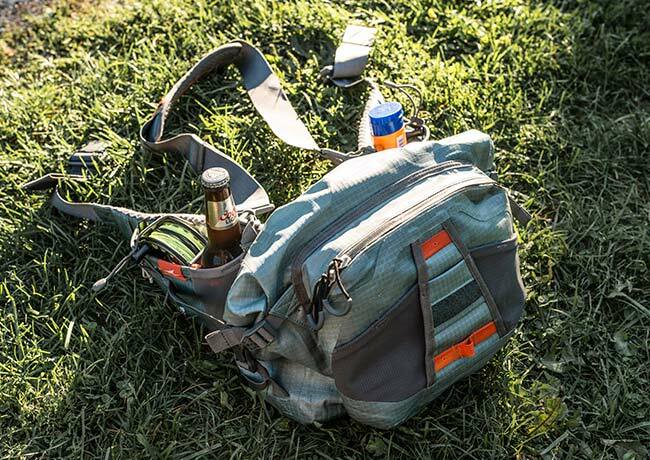 All bags in the Expedition series are rugged to the extreme. Heavy resin-coated polyester canvas inspires confidence that make you want to drag and drop them into mud and mayhem. Oversized zippers make opening and closing a snap with wet, cold fingers. And the open plan of the interiors does not force you to pack in a way that doesn’t make sense for your trip. For something of it’s size and shape, the Gear Carrier is also remarkably easy to move around–because there are handles literally everywhere. There’s really no angle at which you can reach out for this thing without hitting one, so no matter where it is and where it needs to go, you can swing it around without throwing your back out. It’s also chock full of exterior D-ring attachments. This means you can keep things handy outside the bag as well as in: think water bottles, thermoses, tippet stacks, cookware, etc. Plus it’s long enough to accommodate rods up to 10 feet. Last but not least, though the bags come in two colors, I strongly recommend going with what I call “emergency orange.” If the back of your truck is full of 8 shades of olive and brown, something as bright as a highway cone can really help you locate what you need when you need it. As a side note I’ll mention that neither of this bags are specifically designed for air travel. The Duffel is too big for a checked back, and the Gear Carrier lacks the stiff endoskeleton you’d want to protect your contents from industrial level man-handling. But for what they were designed for—a place to locate gear in a car or truck—they can’t be beat. As far as on-the-water gear bags go, there’s nothing I don’t like about the Umpqua Tongass 650 bag, which is the one item on this list that came with me absolutely everywhere this season: India, Labrador, Ontario, Alaska and the deeper Midwest. It was just a great pack for everything. It’s wide open interior with minimum built-in compartmentalization means you can customize gear configurations for each trip. The waist belt comes with plenty of secure storage as well, whether you want to cram it full of reels, clothing, or Nalgenes of Wild Turkey. I actually used this as my carry-on for trips that required air travel and can assure you it’ll get some curious but complimentary remarks from flight attendants. And while it’s obviously designed for fishing, that open, water-proof interior means there’s plenty of room for a DSLR and mid-range zoom, if you’re into that kind of thing. Special note: the water-proof material starts out stiff but get’s more supple with use. I’ve gotten a feeling year number two is the sweet spot for this pack. This insulated growler looks you straight in the eye and demands to be tossed at the bottom of a canoe or kayak. The Rambler gives you a good excuse to check out new breweries—or get inventive with summer and fall beverages—without cluttering your tent or watercraft with glass bottles. Fill it with cold beer in the summer and hot mulled wine in the winter without worrying about flavor contamination—this thing cleans, well, clean. The one thing I’d love to see is some sort of screw-on cup attachment, like the thermoses of yore. For non-beer related consumption, which is to say when caffeine is required, I’ve been packing the ReCharge Autoseal Travel Mug from Avex on all road trips. It’s designed to be spill-proof, leak proof and friendly to one-handed operation. All of this is true. But my favorite feature is the cap that with a click of the thumb encloses the drinking area. 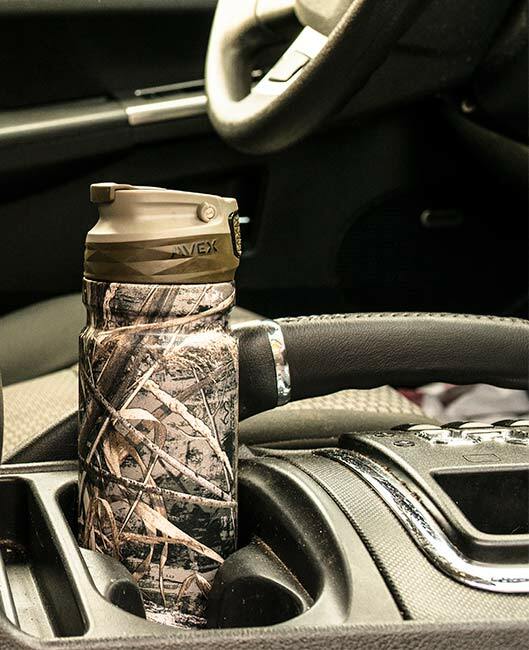 It’s there as extra protection against leaks, but it also means this thing can roll around on a car floor full of dirt and sunflower seeds and still offer a clean sipping surface when it’s time to drink. This past spring while mahseer hunting in India I took note of the abundance and utility of scarves. They were everywhere and doing everything: protecting people from the sun, dust, rain, cold, you name it. I also took note of the abundance of goats: it seemed like every village we met on our mahseer hunt was tending a flock. Given this omnipresence of goats and scarves it was pretty serendipitous that the week I got back I was introduced to a company I’d never heard about, Combat Flip-Flops, to discuss a product I’d never thought about in a fly fishing context, a goat scarf, aka The Cashmagh. The backstory of this company is reason enough to give their soft goods the once or twice over: a pair of Army Rangers with several tours of Afghanistan under their belt create a business and business model where they produce soft goods in war zones, employing locals and giving back to the community in the form of education. Each Cashmagh purchased funds one month of secondary school for an Afghan girl. The first thing you notice about the Cashmagh is that it’s a pretty substantial piece of fabric (about three feet by three feet), and thus large enough to function as a small blanket (if you’re cold in a car or airplane). The second, third and fourth things you notice are how comfortable it is. Like wool, which dominates my cool- and cold-weather layering arsenal, cashmere is a breathing material and retains it’s insulating properties when damp, making this a versatile item, especially in the colder months. I’m already thinking about deploying it on deep winter missions, since when you’re steelheading in Northern Michigan in January, you need at least one part of your body to feel okay. I had previously gotten by on thin wool neck gaits double or tripled up, but this year it’ll be this really cushy goat scarf. A traveling vise means never having that “I don’t have the fly I need feeling” again. What makes the Stonfo Transformer a great on-the-road vise is that: 1) it’s three vises in one, 2) it holds all the tools you need and probably a few you don’t upright and ready to go, and 3) the large footprint of the base and lightweight nature of the entire setup means you don’t have to keep it hidden away in a pouch. 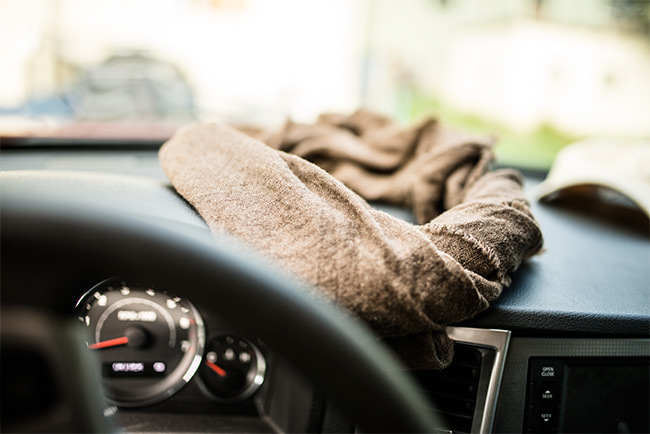 This latter point is important, since the only way you’re going to actual tie on the road is if set-up and take-down are as easy as picking something up and putting it back down on the center consul. If you’ve never tied a fly at a campground or a park bench, let me be the first to say that it’s a pretty liberating feeling, provided the wind isn’t up. Modularity (the Transformer comes with dry fly, streamer and tube fly heads that switch out in .001 seconds) and portability aside, what makes this an all around great vise is the simplicity, strength and smoothness of the working space. This is a tool that aspires to recede into the background while you focus on the fly and your hands. And I like the pedestal design so much that I even use it with my other vises (my Dyna-King Ultimate Indexer still gets the call for tying muskie flies the size of my femur). In short, keep this vise and a bug-out box of tying materials somewhere handy (you can cram a LOT into a shoebox) and you’ll have a way to keep yourself occupied at the motel when you’re waiting for your fishing partner to, you know, wake up already.